Establishing a Coworking Culture; Think Dorms, Not Apartments. Regardless of trends coworking is about fostering openness. Just because coworking is now over 90% private offices doesn’t mean it’s become all about glass prison cells for workers. As an owner or community manager you can avoid this fate of developing a stale, closed-off environment or an uncompetitive business It’s all about the culture you create. The BIG TIP: Think Dorms Vs. Apartment Buildings. 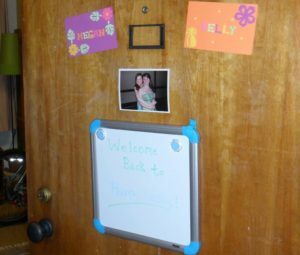 People decorate doors and encourage interaction in dorms. This gives it a sense of openness. 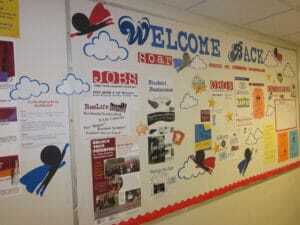 In dorms welcome boards and community updates line the hallways. Any individual can post messages. The board is ever changing even if a little messy. This might help: let’s think about something you’ve likely lived through, the difference between dorms and apartments. I once lived in a dorm called West B while studying at Grand Valley State University. 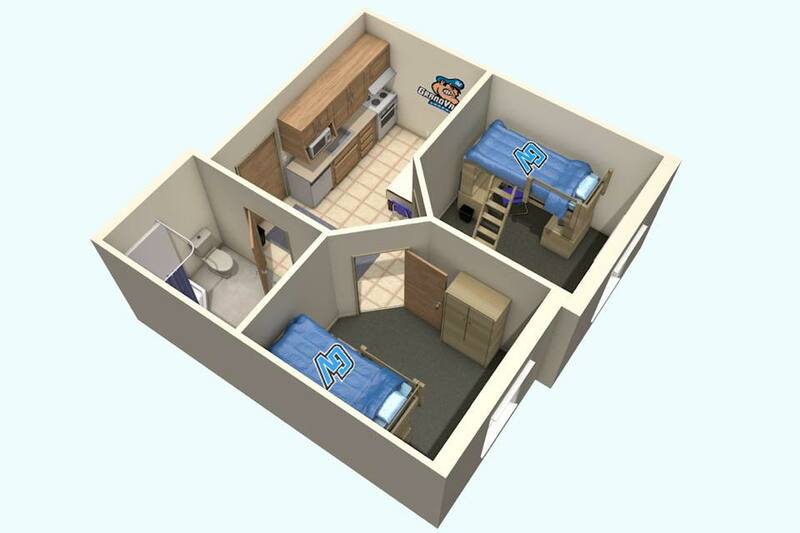 Most dorm rooms are basically two bedroom mini apartments around 350 sq. ft.
Two people will live in these units and share a bathroom. Then there are two wings that each hold around 20 dorm rooms, 10 on each side of the aisle, for a total of 40 dorms per floor. In the center between the wings, there’s a common area students will pass through several times a day. It has a large kitchen, several sofas, an island for people to gather around, fireplaces, and one or two large screen TVs. 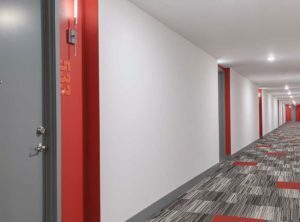 So, dorms are designed to be private enough to give each individual their own personal space; however, they’re encouraged to use the common area if they have guests over and want to cook a big meal or watch TV with friends. It’s intentional design that allows people to interact and get to know each other. This is something community-focused coworking spaces can and should replicate. Doors are defaulted to being open, culturally Doors are always closed. It’s like a hotel. Message boards or shared digital communication by floor or building No communication really used, maybe a message board on the website. RA organizes activities and asks for feedback. Lives in the community. Leasing agents puts on events but little effort or creativity is present. 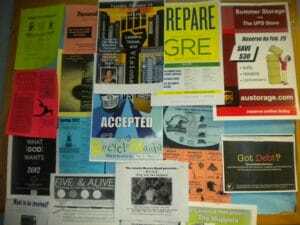 Bulletin boards are throughout announcing outside activities and making announcement. Anyone can contribute. Bulletin boards are locked behind glass. It’s only accessible by management. People that join are greeted with an introduction to the culture and encouraged to join in. People are given their keys, a tour, and left alone with a set of expectations. Apartment are designed to be controlled. This causes people to hide away. On the other hand, let’s look at the modern apartment building. In reality, they are only a little more personal than visiting a hotel once you get out of your unit. Everyone lives in a comfortable-sized space with all of the things they need. And the vast majority only leave their unit when they have a clear objective: to go to their car, to the gym, to their job, etc. Departing, they take one of several exits and perhaps pass by or through an empty lounge space with a dead TV and pool table. This very public amenity in a very large and very private building seems more like a movie set than something people are actually invited to use. Nonetheless, once a month or so, the apartment building throws a cheese tasting or taco gathering, and typically at a time convenient for the staff yet inconvenient for the people living there, perhaps between the hours of 4:30 and 6 PM. This culture of silent hallways, closed doors, inconvenient amenities and events reinforce a culture of being closed-off and territorial. At such a large scale, it can be difficult to break. This is what many executive suites had become before the coworking movement of the early 2000s. At Creative Density, my vision was to put glass doors on all offices and encourage members to keep the door open. Just hearing loud laughter every once in awhile spreads joy throughout the space. I’ve been fortunate that most who join us are open to this idea (and appreciate the decor to boot). All members get a code for 24/7 access and start to think of CD as another home rather than a commercial office. For music, we use Amazon’s Alexa devices, empowering anyone to select a station, share a playlist, or ask Alexa a question. Everyone is in control. We’ve set up a Slack channel where we plan community-wide lunches, share meaningful stories, and ask silly questions. Members also use our messaging boards to post announcements and share words of the day. Each month we even do an event called ‘We Top A’ that’s a potluck where I provide the base of a meal and everyone brings in a topping or side. Remember, people love to contribute when given the chance. Have An Open-Door Coworking Policy. Set Expectations. Start Conversations. Open doors and open policies are an invitation to create community. People hear music and the TV playing, overhear conversations, notice the cool posters and decor and want to be a part. The space is not yours as a space owner, it’s for everyone’, and its culture, policies, and expectations should be an extension of that. If you’ve already opened up and a space that’s starting to feel a bit stale like an apartment building, you can start fixing it today. Start encouraging communication and putting on internal events. As new people move in, start setting new expectations toward openness. The longer you wait the harder it will be change.Your community wants you do this. Your job is to be open to it.